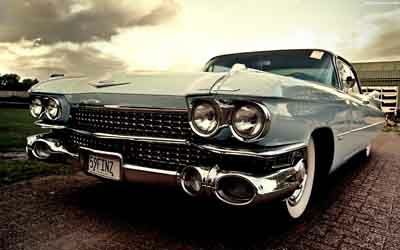 Much of automotive design took cues from the latest technological advances and cultural trends. The "fin" was no exception. 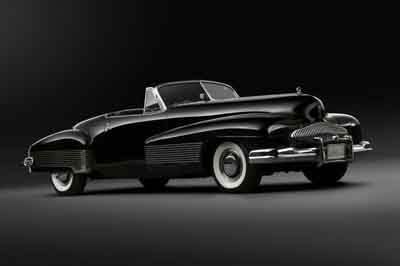 The origin of fins began with the 1948 Cadillac when designer, Harley Earl, drew inspiration from the twin tailed P38 Lightning aircraft. 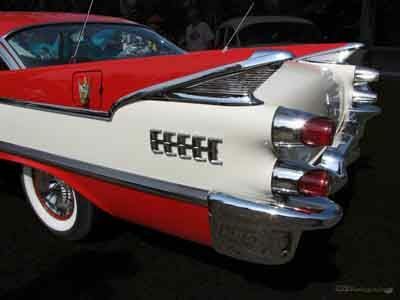 Designs started off small and transformed into the tall piercing fin with taillights. Some looked like jet flames and others had more curves to look like the after burners of space rockets. 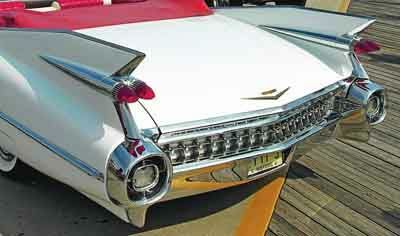 The 1959 Cadillac had two thruster "flames" on each fin. The 1957-1959 Desoto had three. 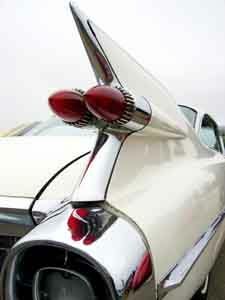 The incorporation of the tail light into the fin design was pushed to new heights and beauty. 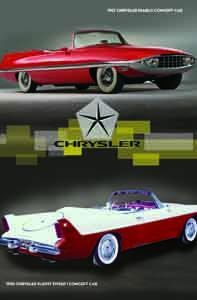 The 1960 Chrysler New Yorker and 300 were stunning examples of fin design. 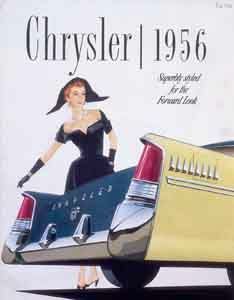 General Motors and Chrysler embraced the boldness of the fin. They engaged in a game of one-up-manship to see who could produce the highest, flashiest fins. Ford took a more restrained approach and produced beauties such as the 1957 Thunderbird with its subdued and elegant fin. 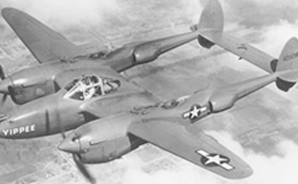 Later, Ford enlarged the after burner taillights in the shape of turbine engines to ensure the impact and flash of the design. 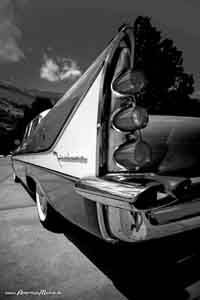 While fins were sometimes hyped as functionally dysfunctional and only used for looks, they indeed had a function. They were a symbol of prosperity and a fine design tool which sold cars. 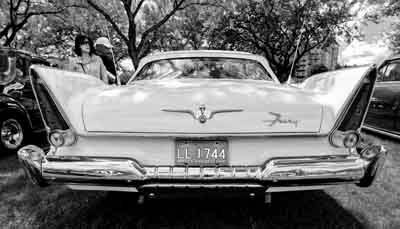 According to Harley Earl, tailfins gave customers an "extra receipt for their money in the form of a visible prestige marking." Some of the most iconic fins almost did not exist. 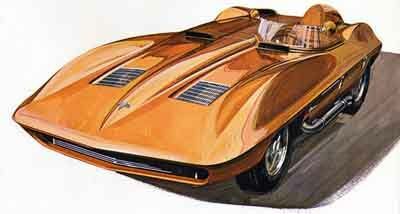 General Motors had already perceived the fin to be outdated by the late 1950s. They were already planning to shelve the fin design. 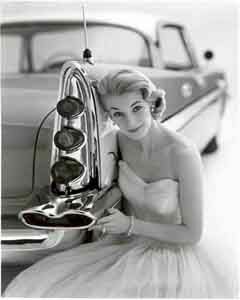 What GM had planned for car design could be seen in the 1958 Chevrolet with fins becoming more horizontal and curvaceous. 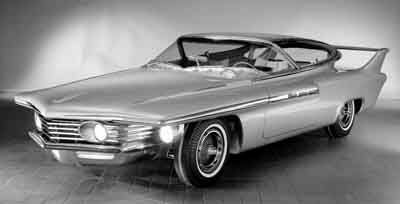 General Motors went even more radical with the 1959 "Bat Wing" Chevy and the outstanding Buick Electra. A young designer named Chuck Jordan happened to drive to the Chrysler Factory and saw rows of the big-finned "Forward Look" Plymouths. Jordan and other younger designers warned the senior design staff that General Motors was going to be out-designed and also out-sold. 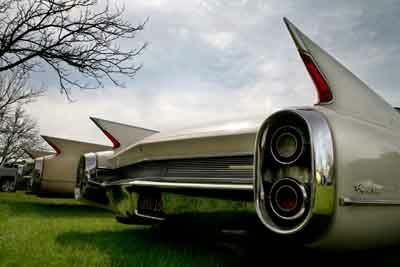 General Motors tabled the planned designs and developed the larger fins, especially on the flagship make, Cadillac. 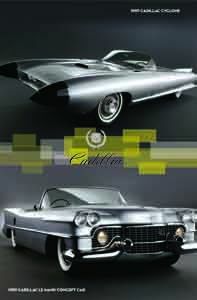 The stellar 1959 Cadillac fin was the result. 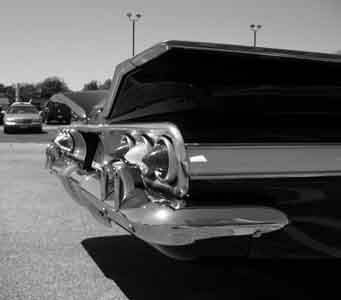 Fins were seen in every make and model. 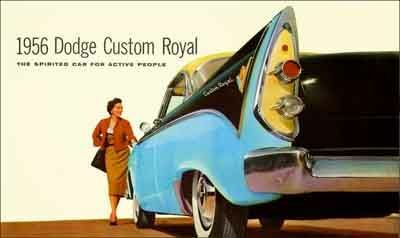 Station wagons had fins. 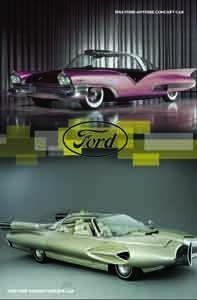 The modified pickups Chevrolet El Camino and the Ford Ranchero proudly displayed fins. 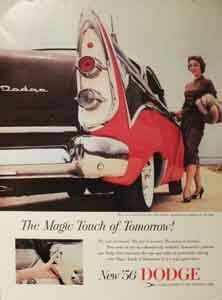 Some makes, such as the stunning Dodge Lancer, had staggered or double fins as did the intriguing Dodge Polara and the 1958 Packard. 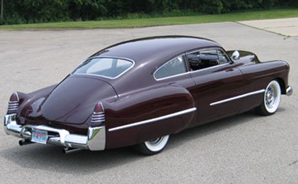 Plymouth had several outstanding fin designs. Even European cars such as the Mercedes Benz sprouted fins. The smaller auto manufacturers had notable fin designs. 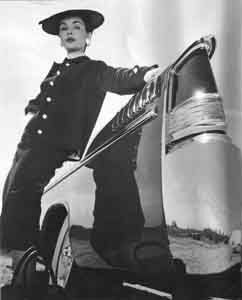 Studebaker, under the influence of Raymond Loewy, produced the outstanding Hawk series in 1957. Kaiser Frasier showed fins on the Henry J. The 1958 Nash Rambler had compact yet striking fins. Hudson had muted fins in 1957, its last year of production. As the Post War era moved on through the 1960s, the fin transformed into horizontal style cues. 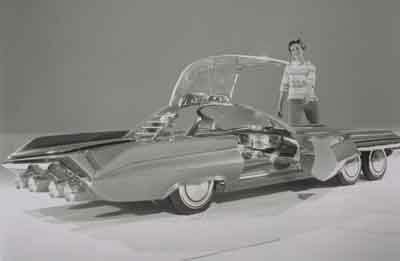 Fins became lower, wider, more incorporated into the body of the vehicle. 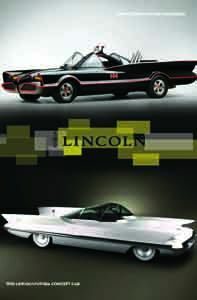 The muscle car era produced one last notable aerodynamically functional fin, (which was now called a "wing") and it could be found on the speed demon Super Bird and the Daytona. These were some of the fasted production cars made up until that time. Perhaps the fin has not entirely died. "Spoilers" remain a popular design detail even on modern automobiles. While the glory days of the fin are past, the models produced during this era remain a testament to the joyous optimism and stylistic mastery of the times. 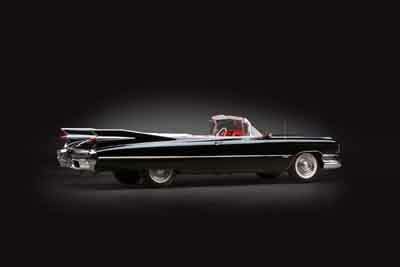 Finned vehicles remain highly collectible and elicit sheer delight with owners and viewers alike. 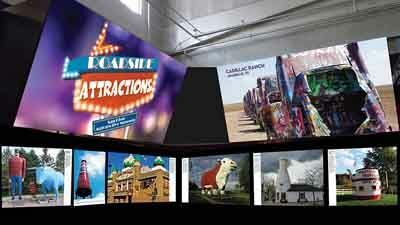 Earl's directive in design was "Go all the way and then back off." 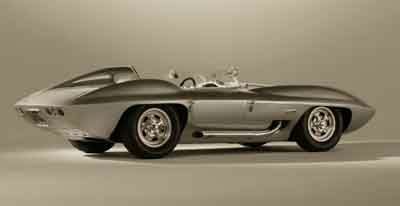 The radical designs of the fin etched an indelible mark on the legacy of car design.